N.B. On Windows XP/Server 2003 only, admin privileges are required for artwork support. Specifies the source of the artwork. This is a title formatting script, that specifies the absolute or relative path to the artwork. You should not specify the file extension. You can use wild cards within the file name. Note: Buggy filters may cause crashes, so this option is disabled by default. 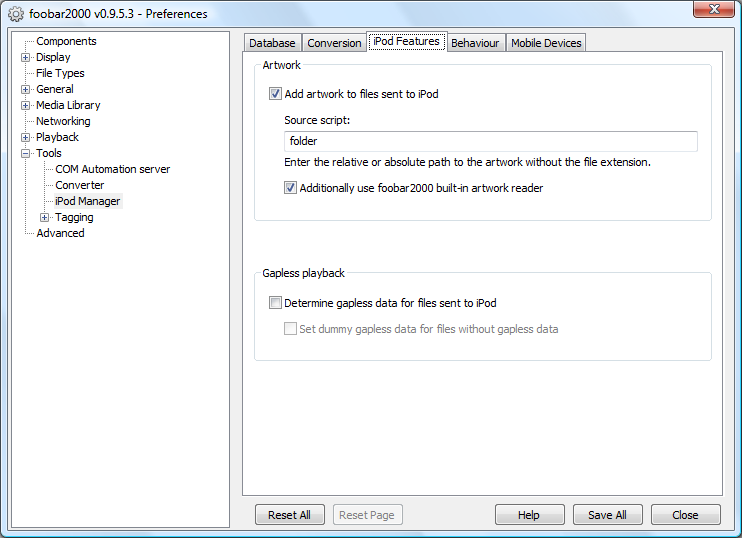 Automatically determines gapless playback data when copying files to the iPod. This sets dummy data for files which the component does not find gapless data. This prevents iTunes from determining gapless data for these files. If you find the component picking up artwork you cannot find, check for hidden folder.jpg files and artwork embedded in your files. After changing artwork settings, you can force the component to recheck for artwork for files on the iPod without artwork by the following steps. Load your iPod library to a playlist. (File/iPod/Load library). Select all files, from the shortcut menu run 'iPod/Update artwork' ('Update metadata' or 'Update metadata on iPod' on older versions). This only works for files sent by the component on the same computer.